The MultiBase 2042 allows optimal utilization of the existing parking space. 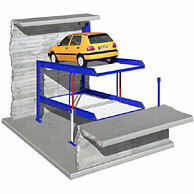 In particular, in case of small installation heights and pit depths, this system offers the most effective solution. Parking comfort and saving space are the major issues here.